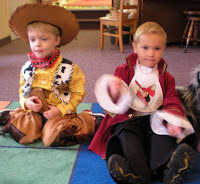 On Thursday we had our Halloween parade with all my little "pumpkins." They did so well. No one cried during the festivities although we had some tears after. We always have a little performance for the family when they come and they did so well! I was very impressed with how well they sang and did their little fingerplays. For most of them this was their first performance in front of an audience--GREAT JOB! After our parade we made our black bats which I will showcase in the color section. The afternoon class even had time to made the paper "jack-o-lanterns." It was a fun day had by all! The kids look like they all had fun. We liked the Woody costume! My sons are big Toy Story fans. Thanks for sharing. There's nothing better than a experience in front of an audience, especially at a young age. Looks like a blast! Oh, how much fun! We had a great Halloween this year- I focus on the creativity and imagination of it all. I know some Christians choose not to celebrate, but I always had so much fun as a child and never thought about it in a negative way. 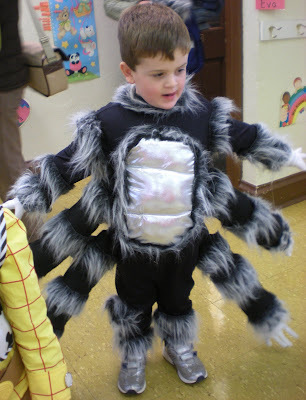 The kids look so cute- love the spider costume. Now time for Thanksgiving and more fall fun! ps. The baby even dressed up this year. I need to post the photos. Yes, the girls painted my pregnant belly. He, He! !